Currently, political research shows the US is an oligarchy where the views of the wealthiest determine policy and the people’s views on issues often have very little or no impact. The US uses the disguise of managed elections to keep this oligarchy in place. In recent years, people have asked us what they should be doing to build an effective movement that can create transformational change. This interest in creating a successful popular social movement comes at a time when elected representation from the two corporate parties is more distant from the people than ever before. And it comes at a time when crisis issues are reaching a point where they can no longer be ignored as a result of the failure by government to address health care, inequality and the wealth divide, economic insecurity, climate change, never-ending wars, racist law enforcement, crumbling infrastructure and more. The world is changing rapidly. 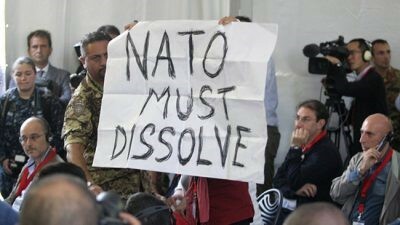 Global dynamics are shifting, and the United States is losing its hegemonic status. Within the next decade, we will need to adapt to the new world and confront these crisis issues. To do so effectively, the movement needs to have a vision of what it seeks and the structure and power to achieve it. At the foundation of political power is education, not only on the issues but also on how to be effective advocates for change. 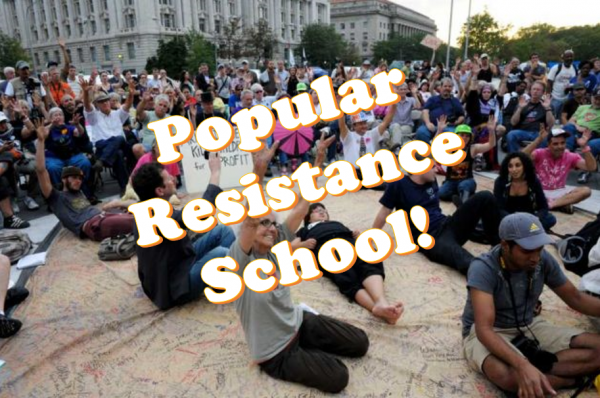 In response to questions about what we should be doing, Popular Resistance created an online school. The first course, which consists of eight classes, provides information about how social movements grow and succeed, what roles different people and organizations play in movements, how to overcome obstacles and how to develop strategic campaigns. In addition to discussing analyses of social movements by leading thinkers on social movement theory, we bring our experiences to the classes. For many years we have worked on a broad range of issues and campaigns. Kevin started by focusing on the drug war and mass incarceration nearly 40 years ago and Margaret left medical practice more than ten years ago to advocate for single payer health care. Together, we have broadened our work to include economic democracy, corporate trade agreements, net neutrality, climate change and environmental destruction, anti-imperialism and peace, and more. We describe how our experiences in these campaigns apply to the current movement and what we’ve learned from the successes and failures of these campaigns. We just completed the first eight classes, comprising the first course from the Popular Resistance school. We are now sharing the classes with you, and we hope you will also share them widely. Over the next eight weeks, we will feature one class each week in the newsletter. Each class is roughly one hour long and includes a curriculum and reading list. We welcome your ideas on how to improve and promote these classes. The first class provides the context for the movement. The consistent conflict is between those who are in power and people organizing for the necessities of people and protection of the planet. In this class, we describe two models of power dynamics. The first model is top-down with the elites, which include big business interests, corporate mass media, elected officials and leaders of the permanent government (e.g., military and intelligence leadership, heads of agencies), in control using laws, institutions and norms to maintain their power. The second model inverts this arrangement with the popular movement on the top determining what happens. This requires people building power for themselves and their communities and weakening the pillars that support the elites’ power. The essential conflict is between a plutocratic government by and for the few and democracy, where the people rule. Currently, political research shows the US is an oligarchy where the views of the wealthiest determine policy and the people’s views on issues often have very little or no impact. The US uses the disguise of managed elections to keep this oligarchy in place. Powerholders seek to maintain the status quo to protect their wealth, income and political power. The movement seeks to shift power to the people and put in place democratic structures and institutions so they have more control over their lives and more benefits such as greater economic security, access to basic necessities like housing, education and health care, and safer environments. Powerholders have many tools to accomplish protection of the status quo. This includes the mass media creating divisions among people to prevent the formation of a unified mass movement. It also includes putting forward false descriptions of what is occurring to disguise reality. For example, the “Patriot Act” was designed to suppress dissent by allowing mass spying on people in the US and around the world, and the Affordable Care Act, which was described as “healthcare for all,” was really a bailout of the insurance industry. These are two examples of many. Fictitious rhetoric is used to describe policies that create no change or minimal reforms to hide the reality that they violate the principles and values upheld by most people in the country and fail to provide the transformative changes that are needed. 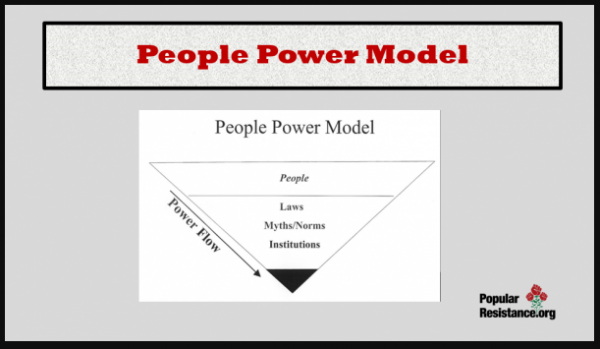 The links to articles on which this first class is based and the slides for the discussion can be seen in the curriculum for the class on Powerholders Versus Popular Power. People also have many tools to overcome the power of the elites. At the end of the eight classes, advocates for change will have a greater understanding of where we are as a movement and what we need to do now to build toward a transformative movement that changes political reality. In the classes we describe how to develop strategies that accomplish two objectives at the same time (1) weaken the power structure by causing divisions in the columns that hold the power structure in place and (2) build the popular movement’s power by creating unity across the popular movement so it becomes a solidarity-based movement of movements. We examine the eights stages of successful social movements and explain why overall we are in the sixth stage, majority times when the movement builds national consensus, which is the stage before victory. We describe the tasks of the movement, for individuals, networks, and organizations, during the stages with a special focus on how to move from stage six to victory in stage seven and the three paths movements can take to achieve their goals. As we build power, the power structure fights back with various tools. The classes examine how the power structure works to co-opt the movement, i.e. draw it into the power structure and undermine it. We also examine in detail the challenge of infilitrators and informants because as a movement grows, the power structure uses these tactics to divide and destroy the movement. In the final class, we examine the basics of organizing and mobilizing people. We also review multiple tools that can be used to create a strategic plan and choose appropriate tactics to go with that strategy. 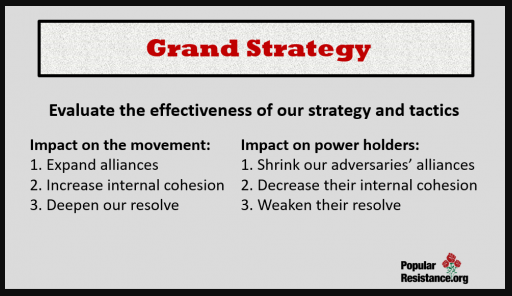 We constantly return to the grand strategy of the movement, i.e. build the movement into a mass movement, not a fringe movement; build solidarity in the movement so our unity is strong and the power structure cannot divide us; and take steps that cause confusion, insecurity, and division in the power structure. If the movement does its job to build power in the next few years, we will make the next decade one of radical transformation that we can only imagine. Goals that seem impossible right now in the current political climate will become inevitable. In the end, we will look back at our mobilizing of people for economic, racial and environmental justice as well as peace and think, ‘of course we won, the people could not be stopped.’ And, those in power will say ‘we always wanted justice, we are with the people.’ And, future generations will look back at these times and see them as a moment in history when the people came together to ensure the necessities of the people were realized and the protection of the planet became a priority. Watch the classes. Share them widely. Create study and discussion groups to augment the work you are doing in your community. Remember, we are the many and they are the few. People have power. The time to prepare to achieve the tremendous potential of the coming decade is now. The contents of Rise Up Times do not necessarily reflect the views of the editor. 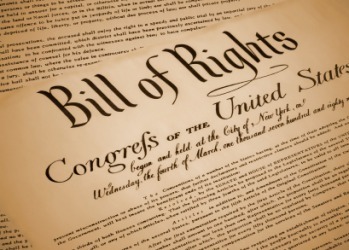 This article was chosen for republication based on the interest of our readers. Rise Up Times republishes stories from a number of other independent news sources. Our country is so far divided pretty much along urban educated v. rural faith based. Great people(Zeese/Flowers) involved and they may just get it done. I wish you well. This might work well in some areas and not work at all in others. I hope there is discussion of how this might work or not work in rural areas and/or farming communities where almost everyone is either a right wing christian republican farmer or closely related to one of them.